Chasing Sunday's first cd, featuring their international hits "The Month" and "Child" - in their signature "jaffopop" style (throwing jazz into folk-rock into pop). This particular album, Shauldeseen's Pocket, gets its name from a radio show in upstate New York where Peter Carucci and Jamie Serino first began Chasing Sunday. The character Shauldeseen, created by DJ T.M.Gonzago, would pull the hottest new songs of the week "out of his pocket." Peter and Jamie performed live on this show several times and titled their first album in Shauldeseen's honor. 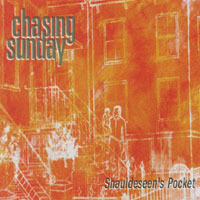 The first track out of Shauldeseen's Pocket, "The Month," was released in Europe and became a Top 50 Radio Single in Spain for Chasing Sunday. In fact, both "The Month" and "Child," the second track on the cd, were in the Top 100 of New York City in 2001 and Shauldeseen’s Pocket reached #10 on The Heat Seekers Chart. "Child" was also featured on a Best-Of-New-Jersey compilation cd: "Artkore - A Hoboken Sampler" in 2002. Although Peter, Wilson, and Frank perform as The Shaves (along with Scott and Ted), Chasing Sunday continues to perform from time to time. Check out Chasing Sunday's second cd Realize, The Shaves cd Let it go, and The Sleigh Boys' Christmas cd.